After steering clear of Apple's iOS for well over a year, developer Mozilla is said to be working on a flagship Firefox Web browser that may soon make an appearance on iPhones and iPads. While Mozilla has yet to issue a definitive public announcement, the pieces are falling into place for a Firefox debut on iOS, reports TechCrunch. The publication said the company discussed bringing its popular desktop browser to Apple's mobile OS at a closed event in Portland. "We need to be where our users are so we're going to get Firefox on iOS," Firefox project manager Lukas Blakk said in a tweet. TechCrunch believes Blakk was paraphrasing earlier remarks from Mozilla VP for Firefox Jonathan Nightingale, who spoke at the event on Tuesday. 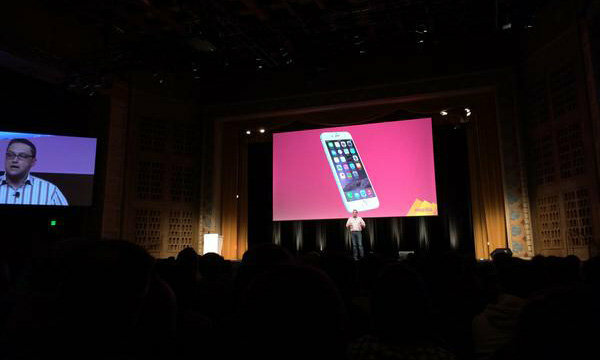 A subsequent Twitter post from Matthew Ruttley, manager of data science at Mozilla, contained the photo above in what appears to be Nightingale speaking in front of a slide clearly showing Apple's iPhone 6. Accompanying the photo was text that read, "Firefox for iOS!! Let's do this!!!" If Mozilla is indeed working on an iOS-compatible Firefox app, it signifies a marked change in policy from the one instituted under former CEO Gary Kovacs. As reported by VentureBeat, Kovacs last year said in no uncertain terms that a Firefox for iOS app would not be considered until Apple relaxes its rules on third-party web engines. A month prior to Kovacs' statement, Mozilla's then-vice president Jay Sullivan said much the same. Mozilla held a presence on iOS with Firefox Home, an app meant to sync Firefox desktop history, bookmarks and open tabs with Apple's portable devices, but the program was killed off in 2012.